For this past week’s trip I had rented a 10 person cabin in Phantom Ranch, and everyone was going to gather at the south rim by Sunday evening for the hike down on Monday. However, my good friend David Vidonic and I decided to drive up on Friday so that we would have two days beforehand to explore the rim itself. On Saturday we hiked near Desert View, heading east onto the flats overlooking the canyon’s easternmost end. On Sunday we decided to do an easy 7.5 mile hike in order to reserve our energy for the hike down the next day. This is the hike I propose every visitor do, if they can. We boarded the Hermit Rest shuttle bus, which took us to Hermit’s Rest, the western end of the Park’s developed area on the south rim. From there we hiked back along the rim trail. 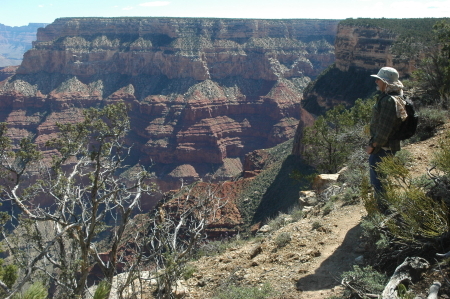 The picture to the right shows David on that trail, looking into the canyon. I had never done this before, and was very surprised at how beautiful it was. To do it right however you need to look for the real trail. For large sections the Park Service has build a paved path for the disabled as well as bicyclists, and this is the trail they advertise. If you keep your eyes open, however, you will see the real unpaved trail off to the side, hugging the rim. This is the trail you should follow, as it is really easier walking and has much better views into the canyon. Ninety percent of all visitors to the Grand Canyon never step off the rim and enter the canyon itself. What most do is drive to the south rim, which is a relatively short distance from major cities like Flagstaff and Phoenix, and go from lookout to lookout, either driving their car or using the shuttle bus provided by the National Park Service. This hike however has you traverse the rim in a relatively untraveled area. You will see fewer people, but more important, you will see the canyon change as you move from lookout point to lookout point. The changing scenery will help you capture the size and scale of the canyon, something that is harder to do if you only stop at each lookout. For those who want to hike to the bottom of the canyon, I have previously advised everyone to give themselves one full day at the bottom to do some day hiking inside the canyon. On this trip, we decided to hike the Clear Creek trail, which zig-zags up to the Tonto Platform on the north side of the canyon 1,000 feet above the river. The Tonto, called the Tonto Plateau on the south side and the Tonto Platform on the north side, is the wide flat green plateau just above the inner gorge of the Colorado River and about 4,000 below the rim. The panorama at the top of this post looks east from the trail, with Brian McMillan and Nicole Davis the tiny figures in the middle for scale. 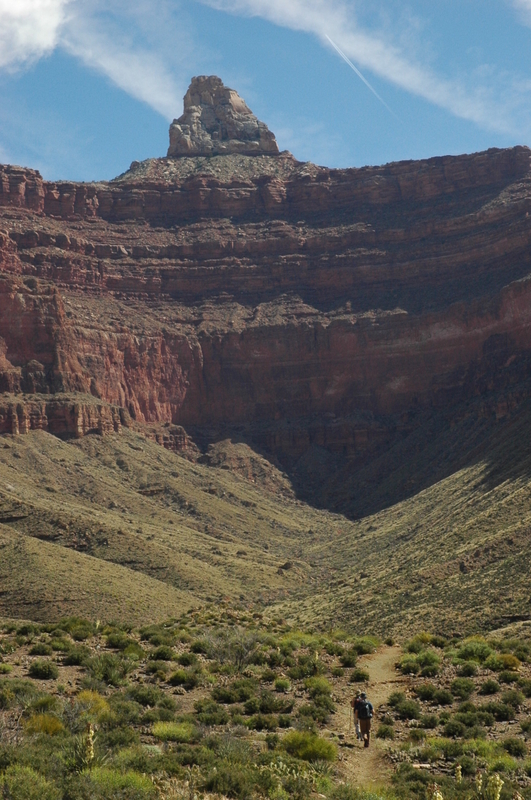 As the Clear Creek trail contours along the Tonto it first skirts along the base of Zoroaster Temple, one of the canyon’s most distinctive peaks. On this trail however you practically get right under it as it rises more than 3,500 feet straight up. The picture below shows the view of Zoroaster from the trail, with Brian and Nicole ahead of me. As you can see, visiting the Grand Canyon is a wonderful thing. I will return of course. It makes me happy to be there. I also hope others make the effort to enter this magical spot. The universe is a great place to visit. Going to the Grand Canyon is one way to do it. Wayne: It depends on whether you are on the rim or at the river. It is always cooler by about 10-15 degrees at the rim. This week it was in the high 50s on the rim and in the low 70s in the canyon, during the day. What sort of amenities at the Phantom Ranch cabin? Wayne: Phantom Ranch has both cabins and dorms. The dorms are separated into male and female buildings. There are showers, everything is air conditioned and heated. The restaurant serves one of the best steak dinners in the world, in my humble opinion. All told, for two nights stay and all meals (breakfast, sack lunches, and dinners) the cost was just over $210 per person, and that’s to stay in one of the most amazing places on Earth. You can’t beat it. Bob, I’m glad to hear that you had another good Grand Canyon visit. Was your photo of Zoroaster Temple taken from where the trail crosses 112:04 W. From the topo, if looks as if some of the most interesting parts of the trail may be on its first few miles, where it offers views into the inner canyon, and then turns in toward Zoroaster. Kirk: My picture was taken at about 112:04 W, as you guessed. The entire trail is spectacular. Moreover, the hardest part, which isn’t really that hard, is the climb up in the first third. Once you are on the Tonto it is relatively level and easy. If you get that far, go as far as you can, with the limit being only the water and time you have left. Excellent map– helps me orient where everything is located. I’m intrigued by this ranch! Wayne: If you want to go to the bottom of the Grand Canyon the easy way, Phantom Ranch is the way to do it. I can provide you all the details if you email me. thank you, I will follow up. The “easy way down”–what? >by helicopter? This Mary Jane Colter, is an interesting lady. Creator of the “National Park Service Rustic” architectural style. I read your piece on hiking the Grand Canyon. In it you mentioned staying multiple days and doing some hiking at the bottom. I’m curious; what do you do for water? Do you carry it all with you or are there sources available down there? Since water weighs about eight pounds per gallon, carrying it would seem out of the question. You also commented that you felt the Park Service discouraged hiking because they wanted to keep the area for themselves. Years ago I subscribed to a magazine that consisted mostly of people describing their hiking trips. They showed all these beautiful places, had lots of article with pretty pictures and in all most every case talked about the need for regulations to keep people out of these places because it was going to bother the wildlife. I found it frustrating to read because of the hypocrisy and finally gave up on it. –they have a fresh-water pipeline. Al: Wayne’s link provides the history. The bottom line is that there is potable water available to refill your canteens or (much better) your hydration bladders at three points on the Bright Angel trail coming down from the South Rim, and at the bottom at Phantom Ranch, and then again at one place hiking up the North Kaibab trail to the North Rim. When you hike on other trails, you bring extra water. I routinely start out with two 3 liter (100 ounce) hydration bladders, which will usually be sufficient for 12-15 miles of hiking, depending on temperature. As for the Park Service, they have a dilemma at the South Rim. Ninety percent of the people there should not far hike into the canyon, mainly because they are unprepared. This causes about 300 rescues per year. For this reason Park Service employees seem to routinely discourage anyone from doing anything, which annoys me to no end. They appear to use no judgment when advising people, even when they are being asked questions from obviously prepared and experienced hikers, such as myself. This policy also means that at the Canyon the Park Service provides the public little information on how to do the hikes there smartly. I think it would be better if they provided the right information, frequently, so that people who did decide to hike into the Canyon would be more likely to do it right. Wayne: Having viewed this video now, I must note that it illustrates forcefully the horrible management coming from the federal government, from Congress, from the Park Service, and from many Presidents, for the past twenty years. In the 1960s, when they first built the pipeline, the federal government found a contractor who made it happen at a reasonable cost. Now, they can’t even get organized enough to make a plan for fixing it. Moreover, the federal bureaucracy and the regulations that Congress has created in the past fifty years has made it difficult and expensive for that government to do anything. The cost to replace this pipeline should not cost $150 million, but for those rules and that bureaucracy. Oh yeah. $10 million a mile, for a 15 mile water-supply line? On it’s face alone, it’s outrageous. Thanks Wayne and Bob. Good information. I visited the Grand Canyon about 10 years ago and just did the tourist thing but felt like I was really missing out. Maybe some day I’ll get out there again and see it the proper way. This Mary Jane Colter is an interesting lady, as is the company for which she worked. Brings back wonderful memories. I can personally recommend (for more ambitious/experienced hikers) any of the inner canyon from the bottom of Tanner trail to Grand View and (now on the Tonto) on, all the way to fantastic Rainbow Arch area (where the rim is accessible by a somewhat tricky (easy to lose) route – preferably in chunks, a week at a time. On the north, the Bill Hall to Thunder River, and the west to, and then up, Kanab – this includes amazing slot canyons and pools. I loved running (literally) down the lower part of Clear Creek (to the river). It is very easy to use and does a great job blending and autocropping the pictures. I have fond memories of living on the North Rim for an entire summer working for the YCC (youth conservation Corps). A summer job for 16-year-old building barbwire fences, flood control, and wood fences to hold livestock out of wildlife management areas. We even made hiking trails near the rest area of the newly completed freeway at Black Ridge south of St. George. (1979) something they would never allow today without million dollar studies. Thank you for taking me down memory lane. Perhaps I will get a chance to take my grandchildren there. Wayne asked about temperature? Robert responded that the rim is 10 to 15° cooler than the bottom. Don’t let Al gore find out altitude determines temperature… They would have to change all of their climate models that does not include this important information. Even though temperature variation between the mountain ski resorts and the valley floor is given on the nightly news, I have yet to see a Scientific formula for determining how much heat is generated by the weight of our atmosphere. The closest thing is the “Chinook winds”, showing how air cools down going up the mountain and then heats back up 5.4° for every thousand feet it comes down the other side. The same effect occurs in the Grand Canyon as well. excuse my ignorance–Does it ever snow in the Canyon? Wayne: The rims of the Canyon get snow all the time. The Lodge at the North Rim, at over 8,000 feet, closes from October to May because there is too much snow there. The inside of the canyon however is more like Tucson, where I live. You might get a dusting of snow on very rare occasions, but even then it will melt within hours. Taken during springtime trip (definitely the time of year I’d recommend), years ago. Chipotle– cool picture, definitely gives me a good spatial-orientation perspective.